This humble little 500–series device does precisely what it claims to do in almost precisely the way I like, not that this came as any great surprise, as I’ve been impressed by Bereich03’s previous products, the Density (reviewed in SOS June 2012: http://sosm.ag/jun12density) and the LC–HC (SOS May 2013: http://sosm.ag/may13lchc). It’s designer, Michael Heilrath, says he intended it primarily for mastering duties. 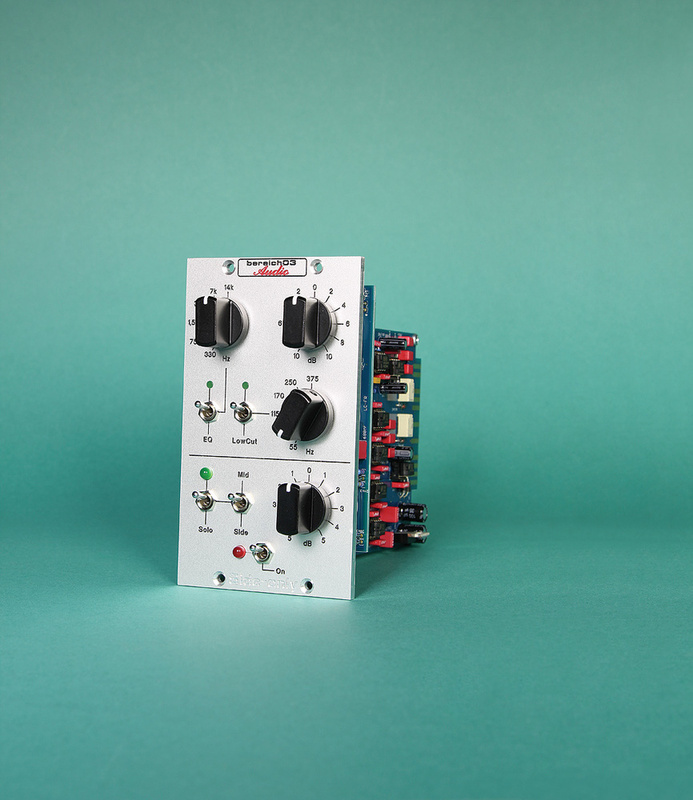 The Side–only, Density and LC–HC are the first few modules of a planned 500–series modular mastering system, which has the potential to be very impressive — but I’ve found it just as useful for manipulating stereo sources and bus signals while mixing. 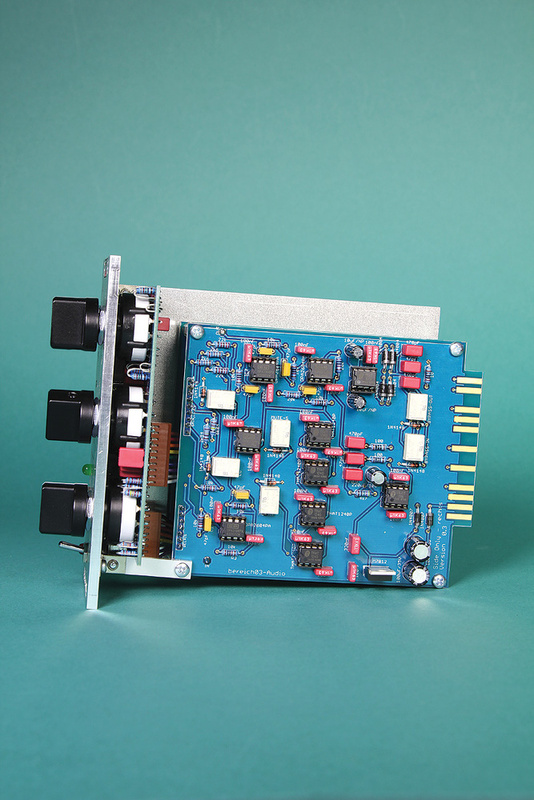 Essentially, the Side–only comprises a Mid/Sides (M/S) encoder and decoder, with a few useful facilities for manipulating the stereo image sandwiched between them. The analogue audio inputs, accepted in the usual way via a host 500–series chassis, are balanced, as are the outputs. You feed a conventional L/R stereo signal to the device, which encodes this to M/S to allow its controls to operate on the Sides signal, before converting to L/R again for the output. While there’s an option to solo only the Sides signal or only the Mid, the processing is performed solely on the Sides, the Mid being left untouched — hence the device’s name. This might raise an eyebrow or two: if the processing facilities exist, wouldn’t it be a good idea to allow them to be switched for use on the Mid signal? That would certainly have made it a more versatile device, but Heilrath says this was a deliberate decision, partly to keep costs (and price) down, and partly because the application for which he designed it didn’t require Mid-signal processing. The build quality is good and the control layout spacious. There are no rotary pots involved; everything’s governed by toggles or rotary switches. Inside the unit are three circuit boards populated with high–quality components such as Wima capacitors, sealed relays and THAT Corporation ICs, the last nestling in DIL sockets that will make repair or replacement easy. The edge connectors that interface with the host chassis/power supply are gold–plated, all the soldering is neat, and all the boards are fastened securely in place. The general idea is that you can control stereo width of the signal in a way that causes no problems for mono playback. But you can also roll off the low end from the Sides signal, and there are several reasons why you might wish to do so: first, removing low frequencies in the Sides signal enables you to avoid any problematic phase–coherency issues in the low frequencies, a way of bringing more ‘focus’ or ‘tightness’ to the bottom end; second, ensuring all the low frequencies are in the centre of the stereo field ensures more equal distribution of power across the left and right channels and thus both speakers in a stereo system; and third, some people like to keep low bass information in the centre for other reasons, such as when preparing material that’s destined for vinyl. The simplest tweaks are performed using the lower half of the double–width front panel. Here, you can choose to listen to the whole stereo signal, just the Mid or just the Sides, and can boost or attenuate the Sides signal by ±5dB, courtesy of an 11–stage switched control on the right. This both allows for manipulation of the perceived stereo width, and to compensate for the inherent level changes in the Sides signal when EQ’ing or filtering — boosting widens the perceived stereo width, attenuating does the opposite. Toggle switches operate the on/off (hard bypass), which has a red status LED, and the solo facility. Two separate toggles are employed for the latter, one to switch to solo mode — a green LED blinks once selected — and the other (no LED, but its setting is clearly visible) to determine whether it’s the Mid or Sides signal that’s heard. I found this dual–toggle arrangement useful, because while a single three–way switch could have taken care of this solo facility (Mid/Sides/off), it would have made A/B comparison slightly more fiddly. A horizontal black line runs above this ‘master’ section and the controls located above this govern the processing. 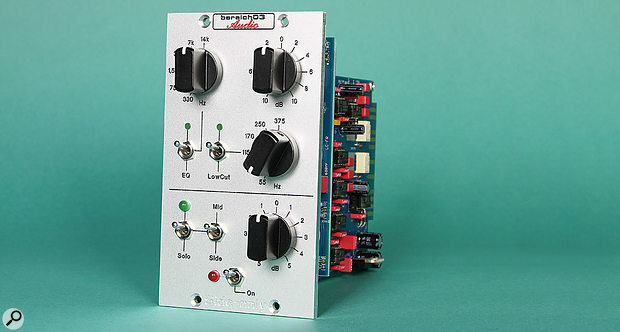 These come in the form of a 12dB/octave high–pass filter (called ‘LowCut’) and a Baxandall EQ. 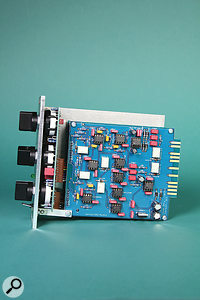 The filter, switched into the circuit using a toggle switch with a flush, green status LED, offers six turnover–frequency options for selection via a rotary switch: 55, 80, 115, 170, 250 and 375 Hz. The EQ, which also offers six frequencies, adds up to ±10dB of gain/attenuation in switched 2dB steps, with unity gain at the 12 o’clock position. The frequency options, again selected using a rotary switch, are 330Hz, 750Hz, 1.5kHz, 3kHz, 7kHz and 14kHz, and the curves are very broad, as you’d wish for the device’s likely applications. Another toggle switch (green LED) allows the EQ section to be switched in or out of the signal path. When testing the Side–only, I used it on a range of sources including a stereo drums bus, the mix bus and, while I make no claims of being a ‘mastering engineer’, on some completed stereo mixes for a DIY ‘finalising’ session. It was very intuitive in use. It’s a nicely engineered no–nonsense device with a refreshingly spacious layout, and it just gets on with its intended function without imposing any sonic character of its own. The switched settings make both recall and A/B comparison easy, and I never felt that there were any useful frequencies missing — the choice of filter and EQ settings seems to me to have been well judged. Furthermore, the switches all felt reassuringly solid, which meant I didn’t feel I had to be overly delicate with them when comparing settings. In fact, the only thing that I ever really felt missing, just occasionally, was the ability to boost or attenuate the Mid signal. But while that might have been useful, it’s no deal breaker, and the same result can easily be achieved by attenuating the Sides and adding clean gain via the next device in the chain. All in all then, the Bereich03 Audio Side–only performs a very useful job with ease, and to a high standard. All of which makes it very easy for me to recommend it to anyone in the market for such a device. There are various companies making Mid/Side devices — Avenson Audio, for example — and others make EQs (such as the TK Audio TK–lizer) or dynamics processors with built-in M/S switching to allow independent control over the Mid and Sides elements of a signal. But those are all more costly than this, and I can’t think of another device that’s dedicated solely to tweaking the Sides. Certainly not in this format, anyway. Easy to use with a spacious layout and switched controls. Decent price for the quality on offer. No Mid level control and no Mid-signal processing options. This useful device does what it claims to do to a high quality, and it does so without fuss and at a reasonable price. €400 (about £300 at the time of going to press). Price includes VAT, but not delivery. 400 Euros (about $440 when going to press) plus shipping.